Hand-harvested and carefully-selected 100% Monastrell, Certified Organic, from the oldest 40+ year bush vines in the Aceniche valley, dry-farmed, from the highest plots at altitudes of 800-900 meters above sea level from nutrient-poor soils. 90% de-stemming and 10% whole grapes, alcoholic fermentation at controlled temperature during 10 days at 24-26°C. Deep, vivid colour with violet rim that reflects its youth. Pronounced aromatic intensity and complexity of red ripe fruits and fruits of the forest stand out from underlying Mediterranean undergrowth of thyme and white pepper notes. Fresh and mellow on the palate, a balanced blend of fruit and spices from the Mediterranean scrub. 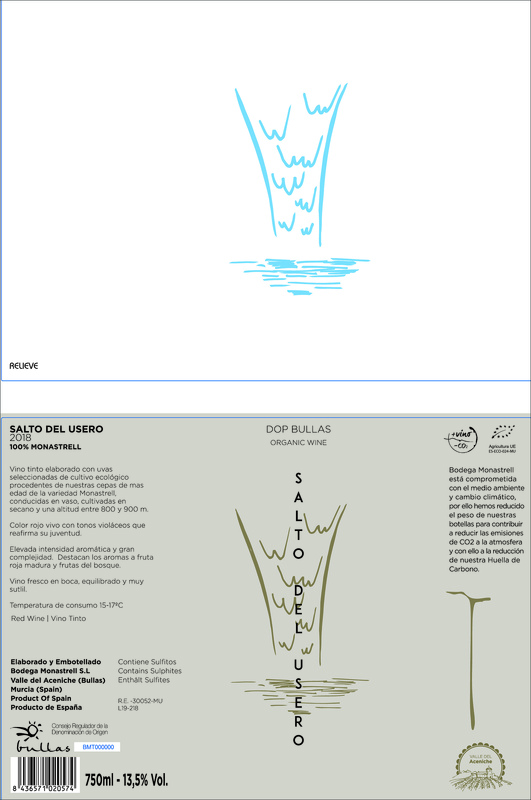 Despite its youth, Salto del Usero is the charming and vivid expression of a high altitude young Monastrell.